There’s nothing more American than getting in a car and just driving, and you should get wheels to match that spirit. 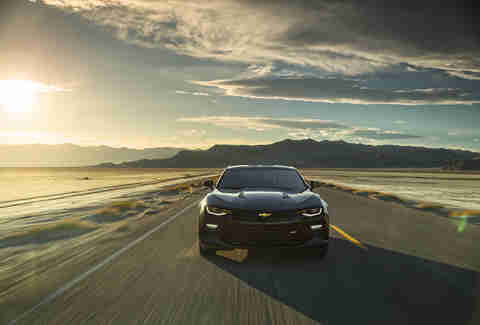 The 2016 Camaro is the sixth generation in this line of legendary performance cars, and with more tech and refinement, it’s more road trip-friendly than ever. So don’t just get there, arrive. There’ s more to the perfect road trip vehicle than good looks -- though those are essential for on-the-bonnet group shots. It also has to drive like a dream, and eat up miles without chugging fuel (it's a road trip, not a gas station tour). 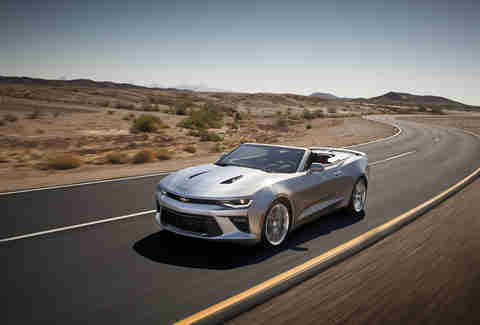 The Camaro SS, with the available 8-speed automatic transmission, offers an EPA-estimated 28 MPG highway. And when you’re not putting in work on the standard 6.2-liter V-8, four cylinders can be deactivated to help save gas. So you’ll mostly use rest stops as intermittent pauses to stretch your legs and buy gas station burritos. Road trips are about what’s outside the car, but an uncomfortable interior will make focusing on the sights impossible. That’s not a problem in the new Camaro, which comes with automatic climate control, Apple CarPlay™*, and a 9-speaker Bose audio system for that obligatory road trip playlist your navigator put together. 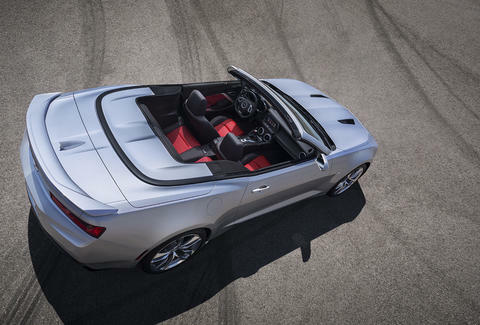 The aerodynamic, lightweight design means more nimble and agile handling, so reduced backseat whining. For a twist on getting off the beaten path, how about ditching the paper-bound road guide and looking for the kinks and detours on the 8-inch touchscreen navigation system? Seriously. With built-in 4G LTE Wi-Fi * connectivity available nearly everywhere, you can choose to stay connected, use it to see the star rating of the hotel where you’ve decided to call it a night, or stream every season of Bones in the backseat. Stand on the throttle, and it comes to life. Drop down a gear, using either a 6-speed manual or an available 8-speed automatic transmission, and you’ll be too busy accelerating to listen carefully to the mellifluous sounds under the hood. And no need to avoid bumpy roads; let available Magnetic Ride Control kick in. *Apple CarPlay vehicle user interface is a product of Apple and its terms and privacy statements apply. Requires compatible smartphone and data plan rates apply. Apple CarPlay is a trademark of Apple Inc. 4G Wi-Fi requires a compatible mobile device, active OnStar service and data plan. 4G LTE service available in select markets. Visit onstar.com for coverage map, details and system limitations.